New parents will want to add this title to their home library book shelves although it won't spend much time on those shelves. Instead, they will find themselves reaching again and again for the volume in order to share their own childhood nursery rhymes with their own children while also possibly creating memories and new favorites for them. David McPhail has chosen some of his favorites read or recited by his mother, and his fondness for the verses shines through in the delicately-colored illustrations that fill the book's pages. He has also included some songs and pages with numbers and ABC's. The book will return many adults to happier, more carefree times while summoning recollections of how they came to love oral language. 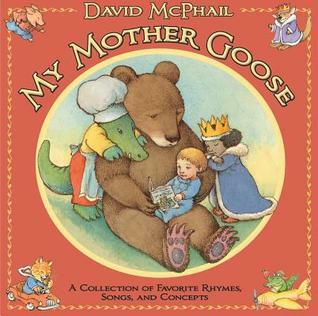 Title: My Mother Goose: A Collection of Favorite Rhymes, Songs, and Concepts Author: David McPhailIllustrator: David McPhailGenre: Nursery Rhymes, Songs, Rhymes,Theme(s): Opening line/sentence: Sing, dance, and romp through David McPhail’s collection of beloved Mother Goose Ryes. Brief Book Summary:This book is essentially a collection of nursery rhymes, songs and pictures that allow children to learn about colors, shapes, the alphabet and different types of transportation. The pictures in this book are not too detailed and defiantly easy for children to look at and understand each story the book contains. It also consists of many different chapters and stories. Professional Recommendation/Review #1:Pubslihers Weekly (August 19, 2013)McPhail’s familiar shaggy-haired toddlers and friendly animals lend themselves to this grouping of more than 60 Mother Goose rhymes. The verses flow naturally into one another. For “Pat-a-cake, pat-a-cake,” a bear baker prepares to put a cake (marked with a “B”) in the oven. On the following page, for “Simple Simon,” a ginger-haired boy requests a pie from an alligator baker. Elsewhere, “Little Bo-Peep” leads into the similarly ovine “Baa, baa, black sheep,” and two bouncing children, “Jack be nimble” and “Little Jumping Joan,” share a spread. Short sections also introduce basic concepts that include shapes, colors, getting dressed, and methods of transportation. McPhail’s welcoming world of anthropomorphic animals and adventurous children is as distinctive and cozy as ever. Ages 2–5. Professional Recommendation/Review #2 :HornbookGuide96 pp. Roaring Brook 2013. ISBN 978-1-59643-526-1 (2) PS McPhail enters the crowded Mother Goose field with this affable collection of sixty-three nursery rhymes and seven interspersed short sections of concepts. Each spread is devoted to one or two mostly familiar poems, and the playful illustrations are afforded plenty of room to interpret the verses, giving the whole an uncluttered, approachable look. The concept sections provide opportunities for welcome audience interaction.Response to Two Professional Reviews: Both of these reviews seem to portray this book as a very simple and easy nursery rhyming song book. It seems as though from reading the reviews that both reviewers did not find anything specifically intriguing and unique to the book. The second review even mentions that some of the songs are unfamiliar which may make it hard for children to read and sing to. I do believe this is an average nursery book for children and there are definitely better ones out there. Evaluation of Literary Elements: I found that alliteration was a key element in this collection of nurses rhymes. Usually alliterations are common in poetry as well as rhymes and this book contains many of those. Throughout the many different rhymes and songs in this nursery book there are ones which repeat certain letters in order for children to easily remember these classic stories. Consideration of Instructional Application: I believe incorporating dramatic play into the classroom is very important. By having the children interpret each story and actually perform it will allow a better understanding for the children. Dramatic play will show them that creativity and expression are important and when reading a certain type of book, such as nurses rhymes, there is a lot you can do with it! This is an excellent and thorough compilation of Mother Goose rhymes. The detailed and whimsical illustrations make the rhymes come to life. Title: My Mother Goose Author: David McPhailGenre: Book of Nursery RhymesTheme(s): Rhymes, Opposites, Colors, Vocabulary Opening line/sentence: “Boys and girls come out to play the moon doth shine on bright as day.”Brief Book Summary: This book encompasses all of the classical favorite nursery rhymes with the addition of McPhails illustrations. The nursery rhymes come to life with a great deal of energy, humor and loveable nature of the stories and illustrations as well. Professional Recommendation/Review #1: School Library Journal. 11/01/2013 PreS—This collection includes many favorites such as "Old Mother Hubbard" and "Hickory Dickory Dock" as well as some lesser-known rhymes, such as "Little Jumping Joan." Though musical notation is not included, the songs housed within will likely be familiar to readers: "It's Raining, It's Pouring" and "Yankee Doodle Dandy," to name a few. Dispersed throughout are small picture-dictionary-style concept spreads exploring subjects like the alphabet, clothing, transportation, and actions. McPhail's illustrations, done in pen-and-ink with watercolor feature his distinctive cast of characters, both human and animal, joyfully enacting each rhyme. Readers will be pleased with this collection of classics.—Laura Hunter, Mount Laurel Library, NJProfessional Recommendation/Review #2: Children's Literature - Beverley Fahey. Beloved children’s illustrator David McPhail turns his attention to the classic rhythms and rhymes of Mother Goose. Over sixty timeless poems are gathered in one volume that should be on every parent’s shelf for babies and toddlers. The rhymes “Pease Porridge,” “Pat-a-Cake,” and “Simple Simon” follow one another as do other thematic poems like “It’s Raining, It’s Pouring” and “Rain, Rain Go Away” and also “Rock-a-bye Baby,” “Diddle Diddle Dumpling,” and “Wee Willie Winkie.” Interspersed among the poems are concept pages teaching little ones, colors, shapes, action words, numbers, clothing items, and an ABC of first words. Whimsical, pastoral, watercolors capture all the joy, energy and humor of Mother Goose. With one page devoted to each rhyme, there is plenty of white space to highlight the words and focus the eye on the delightful illustrations. With baby happily snuggled on a lap, this is a spot-on collection for sharing. In the market for a perfect baby gift? Wrap this book up and you will not go wrong. Reviewer: Beverley Fahey; Ages 3 mo. to 4.Response to Two Professional Reviews: I like how both reviewers took the time to note the basic learning concepts that are portrayed in this book. They are making readers know that this book is very educational. In addition they both mention the illustrations by McPhail and how the use of water colors/ink make his characters distinctive and capture the joy and energy that is mother goose. Evaluation of Literary Elements: McPhail has a very unique style that he uses throughout his book. He uses poems and rhyming stanzas mostly throughout the book. One thing he does that really adds an affect to the book is that his illustrations are full of life and work around the words making the pages energetic. Obviously he uses a sweet, loving and nurturing tone, which is heard from reading the poems and songs naturally. Consideration of Instructional Application: This book provides many opportunities for instructional application. It can be applied to learning of the alphabet, shapes, colors and numbers, clothing and action words/actions. For young children it will be easily applicable to the basic concepts they need to learn but can provide for a fun learning experience. In addition, it can be used to teach children about Mother Goose and classical nursery rhymes that will appear often in their lives. This is a collection of nursery rhymes, retold and illustrated by David McPhail, is written for pre-K to first grade children. Most of them are familiar (“Old Mother Hubbard”, “Hey Diddle Diddle”, etc.) and some are new to me (“As I went to Bonner”, “Great A, Little a”, etc.). A few of the familiar rhymes include verses I haven’t heard before: “Jack and Jill went up the hill/ To fetch a pail of water; / Jack fell down and broke his crown, / And Jill came tumbling after. / Up Jack got, and home did trot, / As fast as he could caper, / He went to bed and bound his head / with vinegar and brown paper.” I can understand why I don't often hear the second verse. It's a bit odd.Many of the rhymes I am not familiar with don’t seem to make much sense. For instance: “Mother, may I go out to swim?” / “Yes, my darling daughter. Fold your clothes up neat and trim, and don’t go near the water.” Also, many of the accompanying illustrations mix different animals – Jack Sprat is a giraffe and his wife is a hippopotamus. I would have been confused as a kid, why wouldn’t Mrs. Sprat also be a giraffe? The illustrations themselves are muted colors and sweet. There is nothing in this book to frighten a child. Everything has a traditional air about it.Overall, I don’t think this would be my go-to Mother Goose book. I think I might look for another that suites my fancy. I think if a child were given a choice of a very colorful Mother Goose book and this book, the child would gravitate to the colorful book. This is a sizable collection (over 60) of well-known and less familiar Mother Goose rhymes. The verses follow a natural flow: similarly themed rhymes, such as bakers and pie men and lost sheep and black sheep, are grouped together. Basic pre-school concepts such as shapes, A-B-Cs, colors, and opposites are also interspersed throughout this volume that is meant to be shared with child and parent or caretaker. The enchanting watercolor illustrations feature anthropomorphic animals that are warm and fuzzy and children that are charming and comfortable. This is an exceptionally well-done collection of classical rhymes and songs. It is a good choice for toddlers, Pre-K and school collections. It can be used for poetry study, rhythm and songs, and vocabulary enrichment. Kids will love David McPhail's illustrations - warm, fun, colorful and lots of cute animals!Parents will love this book because it contains most of all the favorite nursery rhymes plus concepts like shapes, numbers, colors, clothing, and counting. If you are just starting to build a child's library, this is definitely a great pick. A lovely collection of nursery rhymes. I love how the pictures are not too detailed, and how the pages are set up. I would recommend this book to any of my Toddler Time parents who are looking for a book of rhymes to use at home. One of the best Mother Goose collections I've seen in a long time. David McPhail's art is enchanting and this book offers awide selection of traditional rhymes plus concepts such as colors, counting, etc. A perfect baby gift. This is a nice collection, kind of small, but nicely illustrated. Wonderful illustrations..and the nursery rhymes are all in McPhail's book…just a delight to read, and read aloud….enjoy! I thoroughly enjoyed this book. Each nursery rhyme is written exactly as I remember it from childhood. Every child should have this in his or her home library! Collection of Mother Goose rhymes, with sections on the alphabet, color, shapes, action words, and transportation.